The summer heat is here, and along with summer comes thunderstorms, tornadoes, and disasters that could knock out the power, and your air conditioner. If you rely on your air conditioning to survive the summer heatwaves, you could be in for a real challenge if you lose electricity or your AC goes down. In my mid-twenties, my friends and I rented a small house in the city. The place was pretty old, so naturally the AC went down. For over a week. In the middle of July. And despite my daily complaints to the landlord, he kept dragging his feet. Pretty soon it was over 100 degrees inside, and we were absolutely miserable. Even sleeping in my underwear by an open window wasn’t enough to stop me from waking up drenched in sweat. During that week I learned a few tips for staying cool without AC, and I want to share them with you. Don’t be a victim of the heat like countless others. Even warm air will feel cooler if it’s moving. Open windows on the ground floor and shady side of your house to draw in cooler air, and open windows on the second floor to let the hot air out. Your house will probably still be hot, but not nearly as hot as it would be if there were no air flow. Know which direction your evening breeze comes from, and make sure to open the windows on that side of your house to take advantage of its cooling air movement as well. Fans can also assist with air movement, so if you have electricity but no AC, set up fans to push the hot air out and draw cooler air in. Be sure your ceiling fans are set to turn counter-clockwise (when you look up at them). Use curtains, blinds, or blankets to block large sun-exposed windows and keep the light from warming your house. You can even cover your windows with tin foil to reflect the heat. Once the sun is no longer shining on the window, you can open it again. By the way, a sun exposed window is a great place for a solar oven or a batch of sun-tea. But if you do this, position it on the inside of your curtain so the heat stays localized in the window. At night, open the windows once the outside temperature is lower than the indoor temperature. In the morning, before the outside starts heating up too much, close all the windows and close your curtains to keep the heat out and the cooler air inside. One open window, particularly on the Western side, can really heat up a house. During the summer, stay hydrated by drinking lots of water. 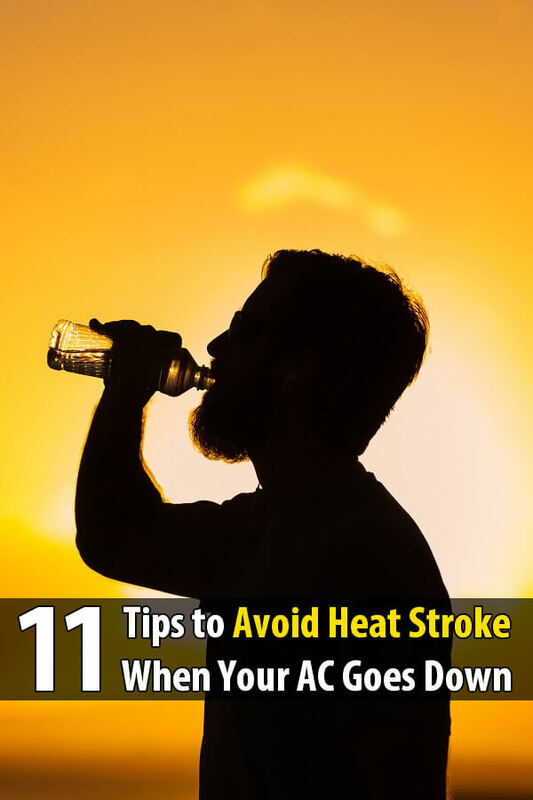 Your body can handle more heat when it’s fully hydrated, and you won’t feel as warm. Keep powdered electrolytes on hand if you are prone to dehydration or low blood pressure, and make sure you consume salt with your food. Too much sweating can quickly deplete your salt levels. Summer is not the time to be on a low sodium diet (but don’t go overboard on the sodium, either). When the weather is dry and hot, a sink or bathtub with an inch or two of cool water can provide a handy evaporation center, which will cool that room a little bit. Of course, if it’s hot and humid this won’t work, but it works well when you’re fighting dry heat. A damp handkerchief, hat, or light shawl can also work wonders to cool you down. On those hot nights without AC, I found a wet bandana wrapped around my neck cooled me down enough to fall asleep. Your body is an expert at adapting to temperature. At the start of summer, a 70°F day may feel hot, but by the end of summer that same day will feel cold. It’s the same with winter temperatures–at first you bundle up with extra layers and coats, but by near the end of winter you’re wearing light jackets. If you are starting the summer with a working AC, try setting it a few degrees warmer than you’d normally set it. If your normal is in the low 70’s, try setting it a little closer to 80. Not only will this save you money on electricity, it will help your body adapt and not feel shocked when going outside. Then if you lose your AC in the summer, it won’t be quite as awful since you’ll already be used to warmer temperatures. The same can be said for drinks. Drinking iced beverages may feel refreshing in the heat, but it’s not the best thing for your body. Iced beverages have to be warmed up by your body before the body can utilize the water, sugars, and nutrients in them. Because of this, a cool drink is actually better than an ice cold drink. Yes, hot and spicy foods can also help you handle the heat. Many cultures start the day with hot spiced tea, a practice that revs the metabolism and prepares it to handle the heat of the day. Anything that encourages sweating can help you handle the heat since it engages your body’s natural cooling mechanisms. Yes, it seems counterintuitive, but it can work. For example, if you have paperwork or computer work, do it indoors from 11am to 4pm. Do outdoor work, particularly anything that needs to be done in an area with no shade, in the early morning or late evening when there is less direct sun and more breeze potential. Outdoor work in a shaded area is best in the mid-morning or early evening. Indoor work, resting, or playing in water of some kind, is best when the sun is high. Along with covering windows to keep out direct sun and heat, there are a few other ways to keep additional heat out of your house. Cook only once a day, and use leftovers, salad style meals, or sandwiches to avoid having to generate heat indoors. If you have to cook during the day, find a way to do it outside in the shade. If you do your own baking or canning, do it in the evening and plan judicious fan placement, open windows, and other means to keep cool despite the kitchen heat production. A cold shower can do wonders to cool you down on a hot day. When my AC was down, I took several quick showers throughout the day. Afterward, I always felt cool and refreshed. The effects of a cool shower lasted for up to two hours in my experience. If you don’t have running water, you could gather some water and use a camp shower (just don’t leave it in the sunlight). Even a lukewarm shower will cool you off. Tight fitting polyester, nylon, or viscous fabrics are not the best idea for summer wear when dealing with heat. For a summer without air conditioning, choose natural cotton or linen fabrics. Linen is preferable as it is a naturally cool fiber, and while it will slow sweat evaporation, it won’t hold heat or dampness against your skin. Choose loose, flowing garments that will help slow sweat evaporation and allow airflow around your body. You may think less clothing would be cooler than more clothing, but not always. Flowing garments slow sweat evaporation, enabling your sweat to function as a personal cooling system. The more exposed skin you have, the faster your sweat evaporates and the less it is able to cool you down. The more controlled your sweat evaporation, the slower you’ll dehydrate, and the cooler you will feel. Air conditioning, while a very useful invention, is still a relatively new phenomenon. People lived without it for thousands of years, and so can you. Thanks for all of the tips. They are very practical but things one might not think of ordinarily. I would like to make one comment of caution. If a person lives in an area where mosquitos are an issue, then outdoor activites in the evening could be a problem as the little monsters appear to be most active then in some areas. Given the heightened fear of mosquitos because of Zika doing tasks late in the eveining might not be the best idea..